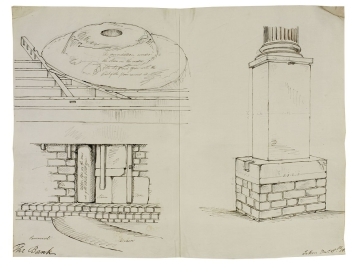 The three perspectives of drawing 10 show first, the foundations under the stove in the centre of the office, second, part of wall foundations with plumbing and third, the base of a fluted column with brick foundations exposed. Soane re-used many of the foundations of Taylor's old offices but strengthened them. Drawing 11 shows the three perspectives of drawing 10 in the context of their surroundings. 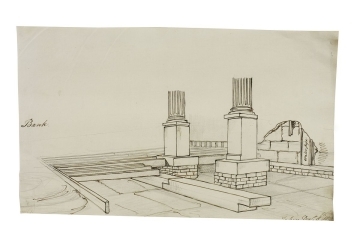 The stove foundations are shown to the left of the drawing, the column base foundations are in the centre and the wall foundations with plumbing behind are shown to the right.